Queens Real Estate Market Report January 2019, courtesy of the Queens Home Team at Keller Williams Realty Landmark II. Looking for a real estate agent in Queens NY? Let the Queens Home Team help you with your real estate needs. It’s February and here in Queens that means the real winter weather is here. So far it has been pretty cold in Queens, however, things have actually heated up on the real estate side. February was an interesting month because it’s when we started seeing the impact of the lower interest rates that we started the year with. So far this has been the talk of our industry and most real estate professionals’ outlook on the market is a little more positive now that the rates are lower, and expected to remain low most of the year. We spoke to a few lenders this month and most of us told us that January was one of their busiest months in a long time. Although most of the lenders we spoke to said their refi’s really shot up, they also told us that new approvals ticked up as well. It’s amazing how much a significant increase or decrease can have on the market and this is just another example of that. So far this month, we have put 5 new listings on the market and most of them have been doing pretty well. The market reaction overall has been better than what we were seeing in the second half of last year so that’s good news. It definitely seems like the lower interest rates spurred some new demand, and moved some buyers into action because now we are getting more offers on our properties. 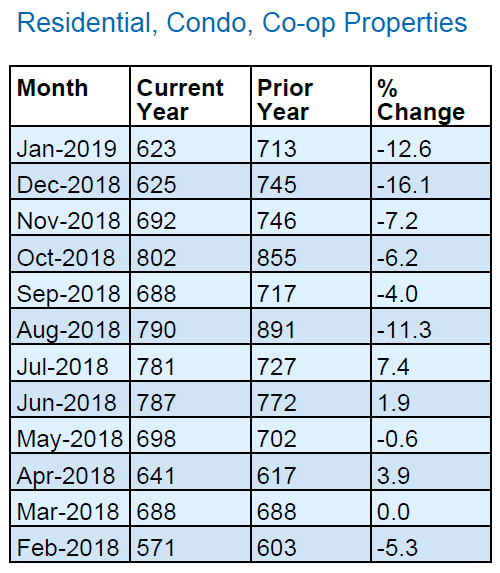 In terms of home sales, they are down significantly and they are officially a trend given the fact that year over year home sales have been down for six consecutive months. The result of this is likely attributed to the higher interest rates from last year. Almost all real estate agents will probably tell you that starting in August last year, things seemed to slow down. Now, with the lower rates, we may see sales go up. Regarding home prices, January had the smallest year over year median home price increase that we’ve seen in a long time. 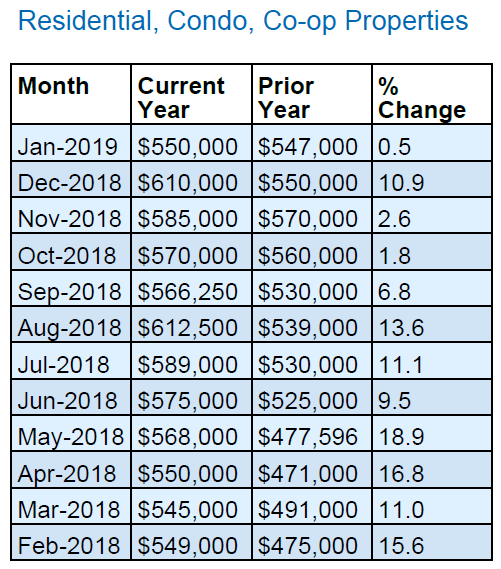 We are used to seeing double digit increases from one year to the next but in January, the median home price was only up .5% compared to January of 2018. This is likely due to the pending sales from the fourth quarter of last year. As the rates kept going up we were seeing the negative impact on prices that the rates are down, we’ll see if the reverse takes effect. And as for month’s supply, it ticked up to 6.2 months this month. That’s up from the 5.9 month’s supply we had in January, but still considered a balanced market. All in all, balanced is how we would describe the market right now because we aren’t seeing a lot of multiple offer situation, but houses are still selling. The difference now is that you may only have one or two offers as opposed to the multiple offers of years past. Good news is that as long as a listing is priced right and shows well, it will move quickly and get a good price. By Rafael Reyes, Sales Manager with Loan Depot in Astoria, Queens. An unexpected drop in mortgage rates in late 2018 has inspired some home buyers into action ahead of the busy spring sales season, spurring an early rush of mortgage applications. The average 30-year fixed mortgage rate was expected to hover above 5 percent in 2019, but instead fell to ten-month lows around 4.46 percent for the week of January 31st. This drop in mortgage rates caused the Mortgage Banker’s Association January mortgage rate forecast to revise the 30-year fixed mortgage rate down from 5.1 percent to an average of 4.8 percent in 2019 — the same average for all of last year. The average rate is expected to stay below 5 percent through 2021. As rates took a dip, house price appreciation is also expected to soften. According to the latest CoreLogic Home Price Insights Report, home prices jumped 5.1 percent between November 2017 and November 2018. By November of this year, that growth rate should slow to 4.8 percent. The Long Island Board of Realtors reported a total of 623 home sales during the month of January. This was DOWN .3% from December and DOWN 12.6% compared to January of last year. When combined with On-line Residential (OLR) Sales, we are reporting a total of 669 home sales in January which is DOWN 16.6% compared to last year. In January, the median home price in Queens was $550,000, this is a DOWN of 9.85 from December and UP .5% compared to January of last year. The median home price has increased by approximately $3,000 since last year. There is currently a 6.3-month supply of housing inventory in Queens, this is up from the 6.1-month supply we had last month, and up from the 4.5 month’s supply we had in January of last year. As for active listings for sale, currently there are 4,691 homes for sale in Queens. That’s DOWN 3.6% from December and UP 28.6% compared to January of last year. To put that into perspective, last year at this time there were a total of 3,649 homes for sale in Queens. Last month one of the biggest things we learned had to do with selling your home at an older age. What we mean by that is that we learned what can happen when you wait to long to sell your house. We recently two transactions and both sellers were in their 80’s. What we saw is that when you wait that long, it’s almost like you get trapped in the home because you may have every desire to sell, but the process itself becomes so overwhelming that it is really hard to get things done. Once you finally decide to start the selling process, then everything from preparing for the sale, to de-cluttering, getting rid of items, showing, planning for the next move, etc become huge tasks. Ultimately, what we realize is that it is much better to sell your house while you are still healthy and active, that way the process itself isn’t that daunting, and you are young enough to deal with the complexities of the transaction. One of the clients bought a house at the same time as they were selling and the whole thing became very stressful for them. The other one rented an apt so that was much smoother. Fortunately they are both in their new places and very happy, but after we closed, the sellers told us “I should have done this a lot sooner”. We asked one of them, “if you could go back, when do you think you would have sold?”. His answer, “I think you should be in the place you plan to live out the rest of your life by the time your 70, this way you can handle the move and the sale while you’re still strong enough to do so.